as born in Santiago de Cuba in 1965. 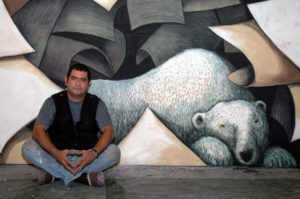 In addition to exhibiting widely in Cuba, he has also shown his work in New York, the Dominican Republic, throughout Eastern and Western Europe and Latin America. In 1996 he won a gold medal at the Third Caribbean and Central American Biennial in Santo Domingo. From the beginning of his professional career Aguilera has been investigating the ongoing struggle between the will to create order and the countervailing forces of chaos. His use of color has come later in his career. Prior to 1998 most of his work was in black and white because he didn’t want color to distract from his ideas. But in the last ten years or so he has grown confident enough to use it to enhance the forces he is framing. However, he remains conservative in its use. Greens and blues are dominant in most of the backgrounds of his paintings while the figures in the foregrounds are generally rendered in pinks and whites.